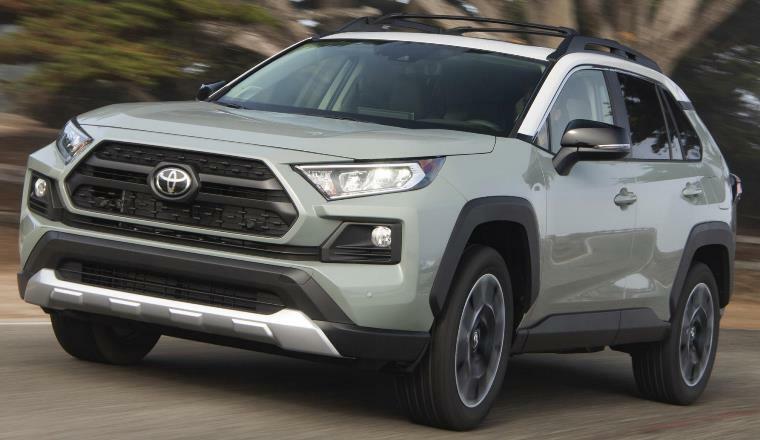 The all-new, fifth-generation 2019 Toyota RAV4, powered by a new 203 horsepower Dynamic Force 2.5-liter inline-four-cylinder engine paired with an 8-speed Direct-Shift Automatic Transmission, has a 105.9-inch wheelbase, 1.20 inches longer than the previous model, adding to rear seat legroom while overall length comes in at 180.9 inches (181.5 inches on Adventure grade) and height is reduced to 67.0 inches (with antenna) on LE and XLE grades and 67.2 inches on XLE Premium and Limited grades. The unibody structure is 57-percent more rigid than the previous model. The 2019 Toyota RAV4 gas models will be offered in LE, XLE, XLE Premium, Adventure and Limited trims and the RAV4 HV will be offered in LE HV, XLE HV, XSE HV and Limited HV grades. The 2019 RAV4 is equipped with the second generation of Toyota Safety Sense that includes Pre-Collision System with Pedestrian Detection, Full-Speed Range Dynamic Radar Cruise Control, Lane Departure Alert with Steering Assist, Automatic High Beam, Lane Tracing Assist, and Road Sign Assist. Blind Spot Monitor with Rear Cross Traffic Alert and Rear Cross Traffic Braking system is standard on XLE grade and above, and optional for LE. Limited grade adds standard Intelligent Clearance Sonar, which is available on XLE and above. The RAV4 LE FWD, with EPA estimated 26 mpg city/34 mpg highway/29 mpg combined, starts at $26,545 (including $1,045 delivery, processing, and handling fee). The 2019 RAV4 gas models are set to arrive next month, and RAV4 Hybrid models following in late March 2019.